In 1621, the pilgrims, just arrived in the New World, had no idea how wild their new frontier could be. Winter arrived and with it came starvation, death, and the idea that maybe it was time to give up and go back to Europe where the strict confines of politics were easier to deal with than the utter randomness of Mother Nature. The real story of what happened next is all but lost. On February 20 of that same year, a ship called The Lyon arrived and delivered much needed provisions which helped sustain the humble colony. The ship was sent over by a Dublin merchant whose daughter was married to one of the pilgrims. Grateful for their salvation, the pilgrims dubbed the following day, February 21, a Day of Thanksgiving. Over 200 years later, President Lincoln decreed the day a national holiday and moved it to the fourth Thursday of November. The pilgrims’ amiable relationship with the Native Americans became the focus of the holiday, and the true origin of the first Thanksgiving remained misconstrued for the next 75 years. In 1938, President Franklin D. Roosevelt moved Thanksgiving back a few weeks because of its proximity to Christmas. He thought that providing more time between holidays would help merchants. The move proved very unpopular with the general public and one year later the date was again changed back to the fourth Thursday in November. Amidst the brief change, however, the origin of Thanksgiving was studied to validate the original date. The Boston Post, the largest paper in New England at the time, took up the story in “The Observant Citizen,” a section of the paper which discussed a wide range of topics. An unsigned article appeared in this section which mentioned The Lyon as the ship responsible for the first Thanksgiving, but the writer claimed that the ship had come from England or Holland. Irish organizations in Boston were outraged and cited anti-Irish bias as the reason for the paper’s failure to mention Dublin as the true port of origin. This article originally appeared in the December / January 1997 issue of Irish America. Was there some Guinness for the Pilgrims? How interesting…I had no idea. The History Channel or somebody needs to make a documentary about this so people will know. It’s a shame this information was lost. About 6 years ago, I attended the funeral of a woman who was a great-great-grandmother, and her husband was a direct descendant of Mayflower passenger Elizabeth Warren. 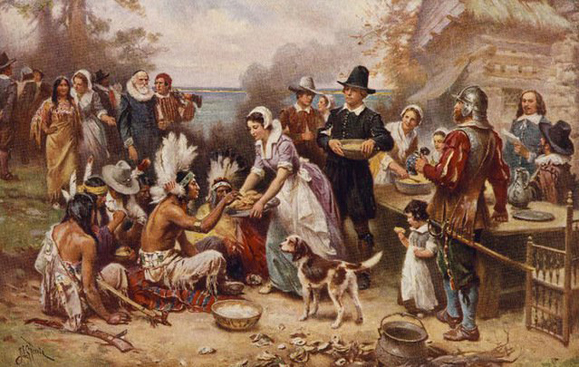 Mrs Warren probably attended the first Thanksgiving dinner. but why they got saved by the irish.